And everything in its place? Well, it seems unlikely that I will ever be that organized, but I am making progress. 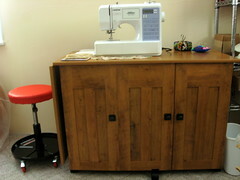 Today's proof is a new cabinet for my sewing machine. Up until now, when I wanted to sew, I was using a tv tray as a table, and while I was able to make it work for some things, it was not ideal. There is so much I like about this new piece. It allows me to have a proper place to sew, it offers storage for various sewing tools and accessories, and it can close up and keep everything protected and out of sight. 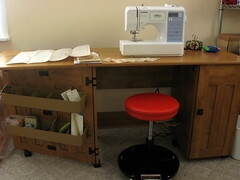 It might take me a little time to organize everything in it, but I am already using it for sewing. I finished Eva's birthday blanket, and I love it. I first saw this blanket pattern over at Grumperina's, and I bookmarked it immediately. I read the tutorial and thought it might be something I could make, so I bought some fabric. I washed, ironed, and assembled, and then it was time to pack and move, so it sat. One day I decided I had better get going on it, so I even managed to do most of the sewing on my old tv tray setup, including making the binding. I finished the blanket the other day after I assembled my table, and I love it. I think it is cute, and can see more of these in my future. ...in the form of battling start-itis. 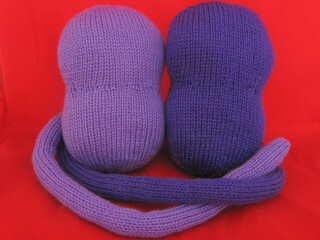 Yeah, The good news is that I have the bodies and tails of a couple of monkeys for the babies finished, and that is nice progress. However, for now, I am having trouble getting myself to sit down and work on the arms and legs. Ah, it will be all right, just as long as I can stop myself from giving in to those start-itis urges. I do have wonderful justifications for each of the potential projects. Slippers--My current pair is in need of replacing, and while these would not be the slippers I would wear full time, (my annual new pair of slippers has returned to Costco, so I will probably buy them next month or get them for Christmas) these would still be great to have in the rotation and for snuggling up on the couch, or while weaving, or really, just whenever, because after all, the weather is changing. I have the patterns for all of these projects, and I probably have the yarn for all of them, (maybe not for the tp cozies, but probably) and they are all totally practical, right? Ah, but I am not casting on for any of them. I will settle down to finish the monkeys soon. I may just need to find the right Netflix marathon pairing. Oooh, brilliant idea: knitting-pattern-Netflix-marathon-pairing-algorithm. You're welcome. There is no real need to worry that I will abandon the current monkeys, Celestarium (making very nice progress on that edging), or other gift projects in pursuit of any of the above right now. I kind of got over it while I spent some time nurturing hurt feelings/grieving/processing a difficult situation. While that is not a good pattern to get into, and I need to be careful about such things, occasionally, there is a time and place for it, and it might involve whiny music and circus peanuts. 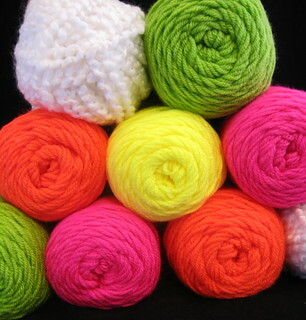 Well, Stacey certainly had it right when she commented on the darkness of the yarn for my Celestarium. It is not a project I work on in low-light settings or when my eyes are tired, but I think it will all be worth it when I am done. I am hoping to finish it by the end of the month, but that is not a deadline. However, I do have some deadlines approaching, so I am trying to keep going on those projects. I call myself over 50% done with the Christmas knitting, but I cannot rest on those accomplishments. Besides Christmas knitting, I have decided to take on making things for a couple of birthdays. I have almost completed sewing a blanket for Eva's first birthday next month, and I am weaving a blanket for Katie's birthday in December. As it has been National Spinning and Weaving Week, it seemed the perfect time to get the yarn on the loom for her blanket. I didn't quite need sunglasses for this, but almost. I think it should turn out to be interesting and something she will really love. 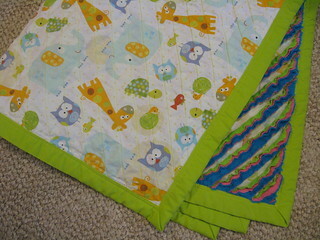 The blanket will be two woven panels sewn together, so it should be a nice size for her. I have some ideas for adding some visual and textural interest beyond the bumpity yarn, but I have not decided anything just yet. For now, I am just glad to have the loom set up and ready to weave. It is so nice to have a room for crafting, especially when it comes to weaving. I could get started on it without worrying about being in the way of anything else, and being able to stop and come back to it if needed and it not being an issue. That sounds a lot nicer than saying I see the charts for Celestarium in my sleep, doesn't it? It is also a better topic than my recent navel-gazing. I've been trying to figure out what I want to do about blogging. Short answer--I want the experience to be better, so I am going to work to do better. That starts with being more active, and if that means shorter posts and more in-progress photos, so be it. You can also look forward to the return of my reading and commenting. I have checked in here and there and keep everyone in my thoughts and prayers. Anyway, we were talking about Celestarium, right? Well, that is something nice to talk about, because I have finished the body of shawl. That's right, I have beaded my last bead. I got out a pile of lace books and looked at edgings until I found the one I think I want to use. 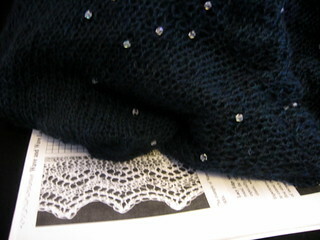 It is from Heirloom Knitting by Sharon Miller, and Wave Lace seems like it should be nice.